Halloween (October 31st), All Saints’ Day (November 1st), and All Souls’ Day (November 2nd) present a great opportunity to introduce a fun feature of our website: Ghost Barns! Many barns in the San Juan Islands have been lost to fire, storms, old age, or demolition. 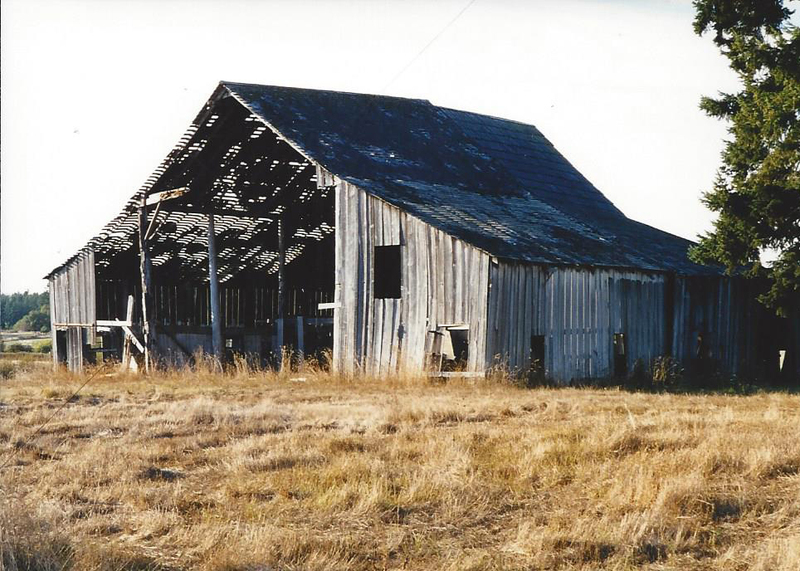 To recognize these barns as gone, but not forgotten, the Ghost Barns page includes as much as we know about each lost barn. In some cases just a small snippet from a newspaper is all that’s known, while for others full documentation (measurements and photographs) has been recorded before it came down. Originally homesteaded by Peter Jewell in the 1870s, Fir Oak Farm was purchased by John P. Doyle in 1897. The barn was built in two sections. In 1896, a 30′ x 30′ gable-roofed central bay with 18′ shed wings to the east and west was constructed. Another 18′-long gable-roofed structure was added on to the north of this section in 1914. The barn was primarily used for dairy cattle, with 30 stanchions lining the central hay mow. It was demolished ca. 2003 after a storm brought the structure down. One of the many forms of documentation that we have for ghost barns is art. 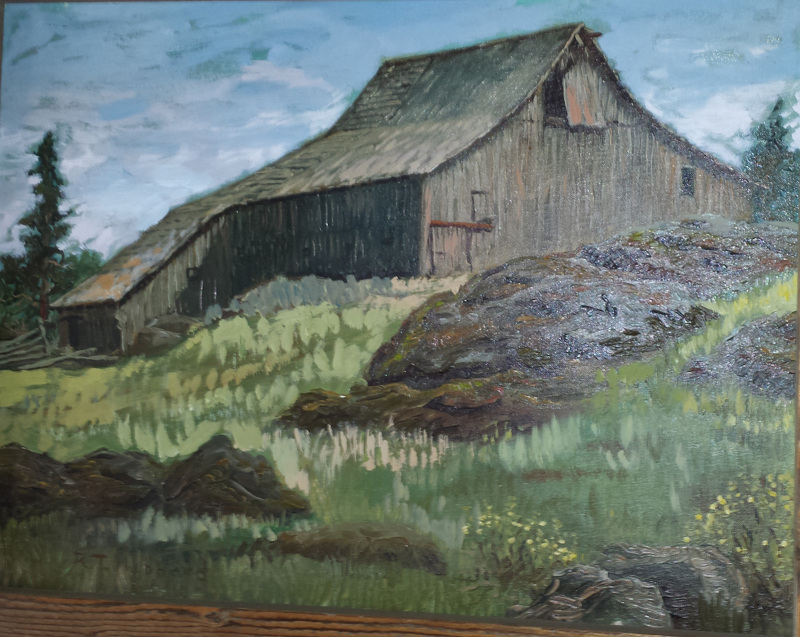 In the case of Fir Oak Farm, Richard T. Hubbard painted a beautiful picture of the barn perched on its rocky outcrop: the view from San Juan Valley road as you headed east. We plan to have paintings like this, and other forms of art, on our Art Page. 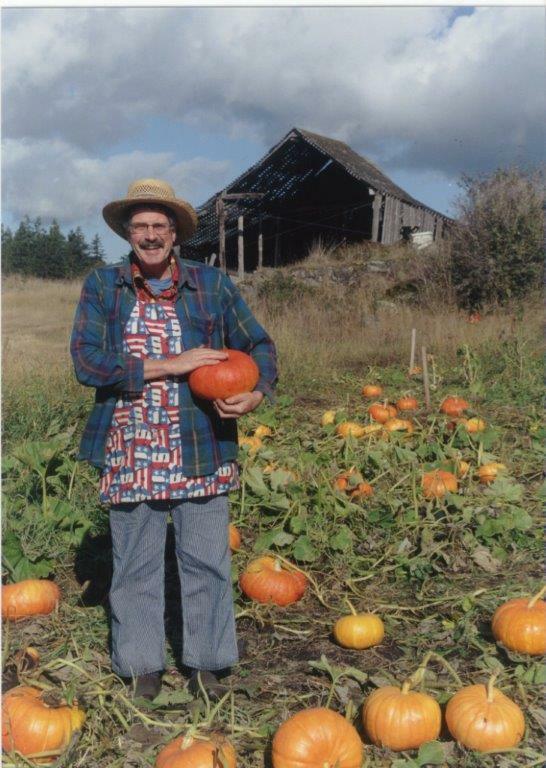 Guard Sundstrom in his pumpkin patch, Fir Oak Farm. Fir Oak Farm is currently owned and farmed by Guard Sundstom. Appropriate for this Barn-of-the-Month Halloween theme, among other crops Guard is well known for are the pumpkins he raises. (Sorry, all of this year’s pumpkins have been sold–try again next year!) In this photo of him you can see the old barn still standing behind him.